1. From the Properties menu select the Run command. 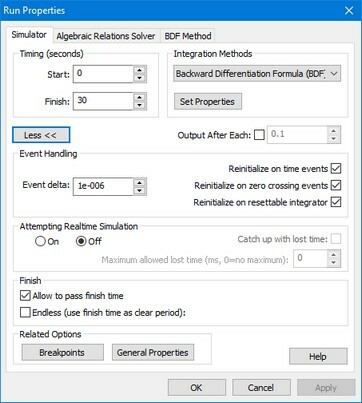 • Simulator: This tab shows the general simulation settings. • Discrete Systems: This tab is only visible when discrete systems are part of your model. It contains the settings for the sample frequency. • Algebraic Relations Solver: This tab is only visible when your model contains algebraic loops that could not be solved during processing. • Integration Method: The last tab contains the specific settings for the selected integration method.